If you've been following this blog for a while, you may have noticed that I've toned down quite a bit. I don't twitter or facebook and sometimes I am tempted to post whatever I like but I'm trying to keep this blog more of a food blog. However, try as I do, I still can't help posting about things that interest me. I think the youngest child is blessed in many ways: parents are older, wiser, maybe financially better off, but the same pros can be cons too. We've already been there and done that with the older kids. The mountains, the sea, the rivers, the pets, horse-riding, the islands, fishing. And with the large gap between the first two kids and the last, we've lost our energy and passion for things that we used to enjoy doing, like the outdoors and even board games. So we've decided to spend more time outdoors with our youngest, putting aside all things on Sunday noons. We did that straightaway yesterday, by going to the Karambunai Lagoon 40 minutes away, despite some reluctance deep inside because it was a melting, glaring 33 C afternoon. It was too hot to fish (there's a jetty for that), so while Wey went scooping the many fishes under the jetty, his aged parents dozed under the trees. Karambunai Lagoon is great, I love it there except for the sandflies. There are no red ants and the place is well-maintained by the hotel. The water looked clear but when I got in, the sand wasn't that clean. We had lots of bites and Hub caught 2 small lai mung (Yi, was thinking of how you always get the first and most fish). I wasn't fishing. Everytime I dropped my line and drew it up, the bait was gone. I ended up throw the prawns into the sea, just to see the different fishes that came up to nibble. A couple of guys nearby were using fishing rods and drawing in a fish (very small ones) every 10 seconds. 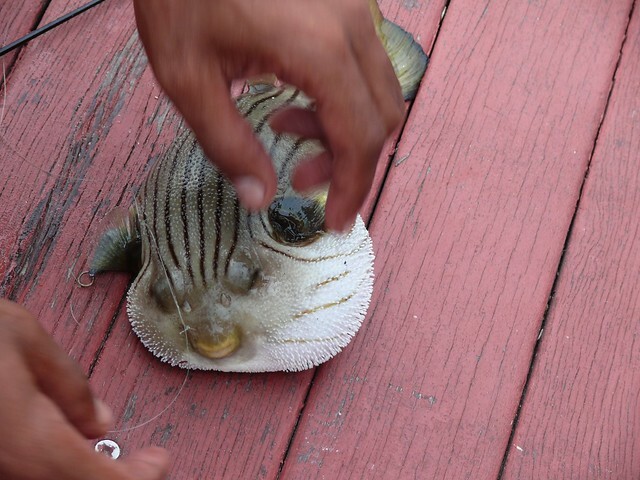 Then they caught a puffer fish and left it lying around because they said it'll last 4 hours out of water and they'll throw it back before they go home because they didn't want it to get on their hooks again. It looked so pitiful, eyes all sepet (slit eyed, like me) and there were teardrop-like things at the corner of each eye. ...and puff, like it was going to explode. It also made puffing noises and spewed out a jet of water. I think it looked like a bird, with a 3-D face (fish have only 2-D? You know what I mean) and look, it had buck teeth. It looked almost human, sad and resigned. I borrowed the fish to photograph it and after a while, I told them I had lost it. I forgot to take a photo of it deflating and swimming back to the sea. 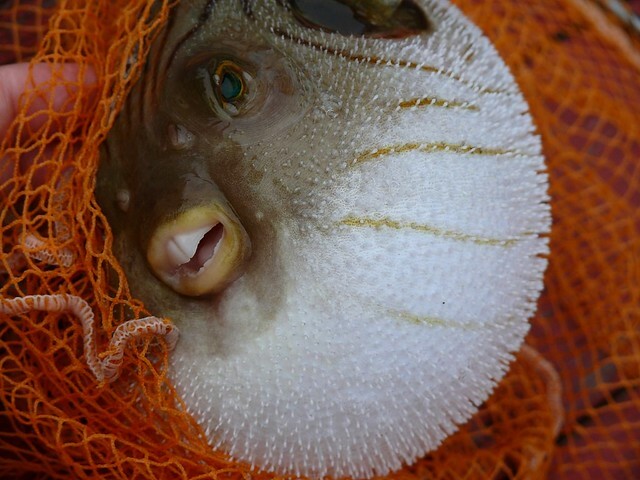 Wow such cool shots of the puffer fish! yi: no kidding. so fast? i thot you waiting for a european? My husband found your blog, I don't know how. I love your postings, doesn't matter what they are about. Thanks! Wow!! 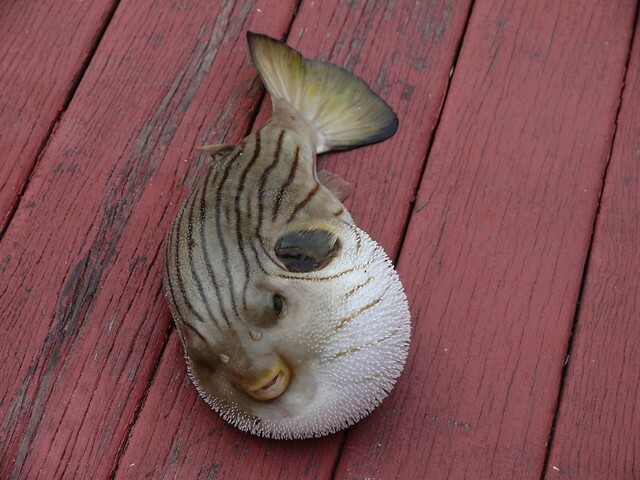 I never thought we could get puffer fish here. Ya, the fish do look sad and like it is crying..
You got very good photography skills! I wish I had your talent with the camera..
but i should have realized where you were going with this, and the fish. goofy looking creature it is. Want to go on a fishing trip and have some comfort at the same time? Then why not go to a fishing lodge? It's Cool! 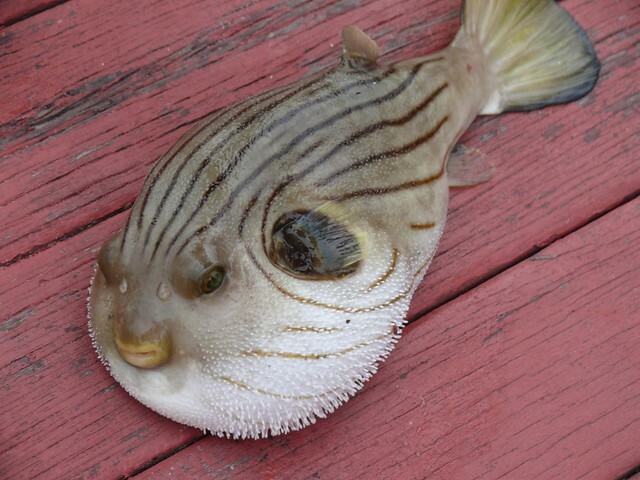 Someday I want to catch a puffer fish too and take some photos of it and I will release it to the water again. Please pay visit to this site if you want to do some fly fishing in your life.